Money is prioritized to other things rather than a new car. You have to scale down the amount of stuff you 'need' when you go on trips with the baby...pack only a pram and some essentials! Loading and unloading baby from the rear door (for rear-facing seating) is easy. 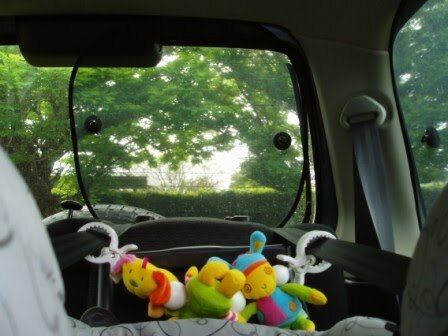 Rear-facing infant has a fantastic view out of the back window. Baby is close enough that the front passenger can reach back to touch the baby. This is really good for soothing whinging/crying baby with a foot massage on a long trip! The driver should not allow themselves to be distracted by the baby while driving. Ride is bumpy - baby is not going to get to sleep very easily, unless the road is smooth bitumen. Post-partum mother isn't too happy with the bumps either. Note: we put in new shocks, and the baby does sleep in the car. When the infant car seat is forward facing, care is needed that the front passenger seat isn't pushed so far back that baby's legs are squashed. Forward-facing baby can kick the back of your seat once she grows to approx 75-80cm long. Of course you can always bring your seat forward, but that has its limits! Is the Jimny safe enough? The rear anchor belt of the infant car seat reduce the amount of space available for luggage, in the rear stowage area. While it's feasible to have one child (infant or an older child that needs a booster seat) in the car, it is much less feasible to have two children due to the lack of space for extra bags and things that come with children when travelling around. Less room to nappy change a baby that is getting bigger and bigger... although for the pros side there is less room for your baby to fling poo around.